In every big city you can find a games bar nowadays; a place where you can get together to play boardgames with friends1 while having a drink and possibly some typical bar food. In these kind of places, you have a higher than usual chance of finding chess inspired decorations. Take for example Barneby, a games bar situated in the hip Neustadt district in the North of Dresden. 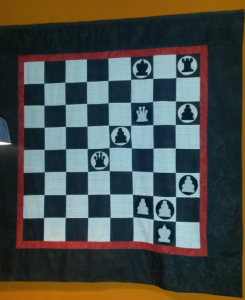 On the northern wall, right opposite a shelf filled with board games, you can find a tapestry that puts the Bayeux one2 to shame: this one features chess. This is a great testimony, I feel, to the unique position chess has amongst board games. I just cannot imagine any bar with a position from abalone on the wall – and that’s still a rather photogenic game, it’s completely unthinkable for something like Agricola. It is also a great testimony to whoever made it that the position seems rather realistic. An extra diagram is unnecessary here, as the decoration we’re looking at de facto is a diagram. The first thing one notices immediately is that white is a rook down, shortly followed by the fact that this doesn’t matter because he has a perpetual check on f6 and g6. Should black unwisely decide to sidestep this with Ke8, he will find himself in a heap of trouble after Qxh8+ and Qxh6. It seems reasonable to think that white has sacrified his rook in order to force this perpetual. A possible configuration seems to be something like the black king on g8, a black rook on f8, a back pawn on f6, a white rook on b8, and a white queen on b6, although in this specific case an immediate Qxf6 instead of Rxf8 first would, it seems, have worked as well. Perpetual aside, the rest of the position looks pretty plausible, too. The pawn configuration is very natural. White has castled and, once his king was in safety he has launched an attack, probably giving some material to prevent black from castling. As the attack turned out to not be winning – or perhaps because white missed his chance – he bails out and takes the draw. Realism: 5/5 Like in my post about the New Yorker, I suspect that this might be a position from an actual game. Like there, any help is appreciated. Probable winner: Odysseus, unless someone does something spectacularly stupid.